After a ten day absence from riding, I hopped on the bike and went up my favorite road, Ouray County Roads 2 and 4. I saw that areas near the road had been burned. You can see the smoke in the picture above. But it’s all part of a controlled burn. The details are on the sign in the picture below. 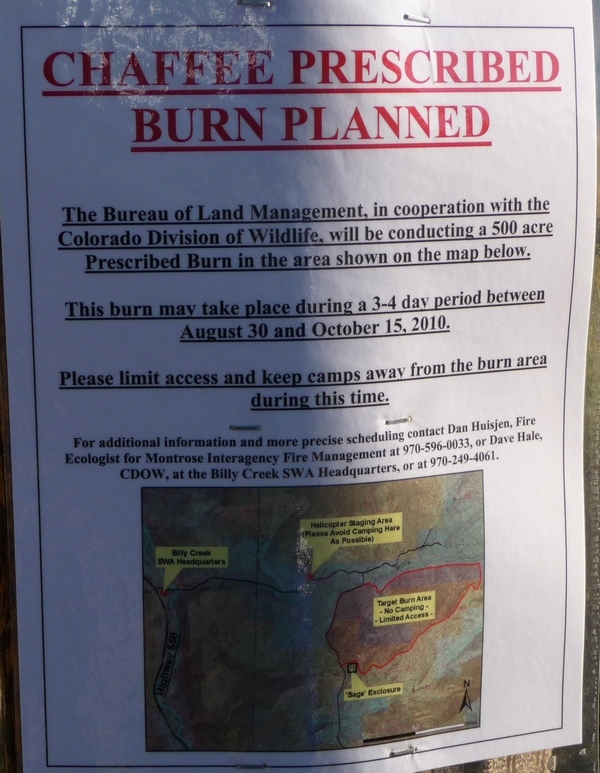 Here's the sign, posted at the easternmost end of Ouray (Colorado) County Road 2, that describes details of the controlled burn. Note that this sign is nowhere near the actual burn zone, though the map accurately reflects where the burn is taking place. This entry was posted in Motorcycling, Ouray County and tagged brush fire, controlled burn, fire, ouray county. Bookmark the permalink.